In this post I’m going to make an assumption you’ve used MVC before. Because of that, I’m not going to cover the why as much as the how and compare it to the earlier versions. Out of the box with a new project, MVC get’s configured for you but let’s look at what that means and why you’d care. The order of these middleware calls are important as if MVC is called before Identity is called, then authorization is never reached. Though not a hard and fast rule, the last piece of middleware I’m using is usually the UseMvc call. You can see that you can configure routes directly in the UseMvc method like you’ve probably done in previous versions of MVC. In the current version of the tooling (at least on my machine), all the “Create View” and “Go to View” integration seems to be missing, but that was just a shortcut anyway. 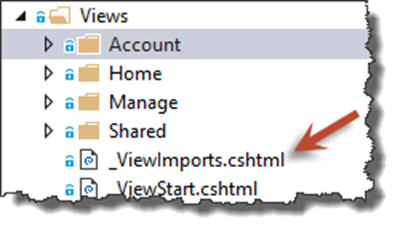 This is bringing in the three namespaces to all the views as well as adding the default tag helpers to each view. But what are tag helpers? But as an alternative, Tag Helpers allow you to make this much more concise with a syntax that is based on attributes that start with asp-*. While we could have crafted an ActionLink or used the Url class to handle this, the tag helpers (the (asp-controller and asp-action attributes) are transformed to a href for us when this is rendered. asp-for: Used to specify properties are mapped the @model of the page. Works for labels and form contols. asp-validation-summary: Used to show the validation summary (for the model or the model and properties). There are a number of other tag helpers that you can use but hopefully you can see the power of them on display here. I like this new model as it allows most of the pure-HTML approach to be used and just decorate it with the MVC helpers as necessary. It’s not as jarring to read either, though some will argue that it’s hard to see what is client-vs-server code here. Whether you use tag-helpers or not is more a matter of style than rule, but I, personally, like them. Next time, I’ll use the MVC 6 framework to expose an API and say goodbye to Web API reluctantly.